﻿ It’s always interesting to hear the tales of how the seeds for a business deal were planted and ultimately came to fruition. Take, for example, the Sheldon/Windermere Building on Indian Avenue adjacent to Chelsea Square in Redmond. 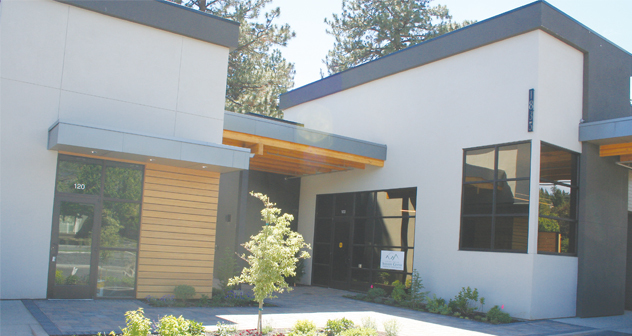 Dr. Todd Sheldon, a practicing optometrist and eye disease specialist with clinics in Prineville and Redmond, originally purchased the property three and a half years ago with a vision of someday expanding his practice in Redmond. Sheldon’s original plan was to build two structures, occupy one of them and either sell or lease the other building to businesses that would hopefully be compatible to his practice. Over the course of the planning stages for the infrastructure, a new road plan prevented Dr. Sheldon from constructing two buildings and he decided to maximize his building space that would allow him to have enough room for his practice to grow in Redmond over the years. He contacted Cleve Brock, broker of Windermere Commercial Real Estate, and they began plans for leasing the open space. Brock became intrigued with the plans for the new building and told Dr. Sheldon that he was looking to consolidate the realty company’s commercial, residential and property management divisions. Ultimately, a deal was struck. Brock was the partnership benefited both parties. Architect Scott Steele teamed with contractor SunWest Builders in creating a design element that emphasizes natural lighting and actually gives both Dr. Sheldon’s Central Oregon Eyecare and Windermere Real Estate their own presence despite sharing the 11,240 square foot building and accompanying parking lot. The exterior design elements were staggered so that Dr. Sheldon’s practice has a northern entry, signage and storefront windows while Windermere’s three divisions occupy the southern wing of the structure. Both businesses have great “curb appeal” to passing motorists and pedestrians in the rapidly growing mixed-use area where the old Deschutes County Fairgrounds once stood. “We are always careful to design multi-tenant buildings in a manner that provides opportunities for strong individual identities and presence from the street,” said architect Scott Steele. “We do this by analyzing the site and then designing the building’s plan, form, massing and fenestration in a way that adds character to the pedestrian environment of the street and creates ‘identity opportunities’. 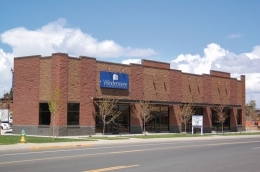 Windermere’s commercial and residential real estate divisions headed by Brock and Veta McNair, feature open reception areas, 14-foot high ceilings, transom lighting and a true professional look with granite countertops, slate flooring and soft, earth tone colors. The commercial division is accented with Western-theme art by water colorist and illustrator Bev Doolittle and includes a mini-bar with microwave and refrigerator with easy access. The comfortable and accommodating conference room includes a flat-panel plasma TV that offers virtual tours for clients or training for brokers and agents. Brock and fellow broker Pete Rencher along with marketing director and broker assistant Kimberly Handley have their own offices with glass frontage just off the main lobby area that continues the strong professional presence. Interior designer Lisa Lambert said the vision for the interior was to create a “comfortable human scale within the interesting angles of the architecture”. Next door, McNair enjoys the eloquent and welcoming feel of Windermere’s residential division where carefully planned space, modern cubicles and a centralized work center have increased efficiency and allows for more team work among the agents. There is lots of storage space and cubby holes for flyers, materials and other general information that agents needs to list and sell homes and the multi-functional conference room, complete with a sliding door to split the room in half, is utilized every Tuesday when all of the agents meet. Bea Leach, the company’s principal broker for Eagle Crest Resort and Properties, shares the office responsibilities with McNair. Dr. Sheldon’s retail contact lens, prescription glasses and eye care center offering LASIK surgery occupies about 3,820 square feet and services an estimated 3,000 to 4,000 patients. The front doors lead to a large retail center and fitting area where patients can choose their eyewear and get properly fitted for maximum comfort and wear. There is also a contact fitting room and optical lab where technicians can make repairs. An exam room, LASIK surgery room (Restore Vision Center performs an average of 50 surgeries per month) and pre-procedural rooms for testing of cataracts, glaucoma, macular degeneration and other disorders plus visional field testing all are part of the operation. Dr. Sheldon, born and raised in the Pacific Northwest and a graduate of Brigham Young University, is a former staff physician at a naval hospital who developed a vision correctional program for fighter pilots. He has also received research grants from the National Eye Institute for his studies on cornea and contact lenses. The eye care clinic also works closely with area surgeons to ensure a positive outcome and Dr. Sheldon performs the post-operative care to minimize patient inconvenience. The end result is two businesses under one roof with a great interior and exterior feel that compliment each other and emphasizes strong sustainability elements of design. ﻿﻿﻿“Part of the spaciousness inside is a result of our standard best practice of sustainable design,” Steele said. “We always strive for a high degree of natural daylight and access to exterior views. The high windows and light monitors in the ceiling really have a positive impact. In the end, Dr. Sheldon is pleased with the new facilities and his new neighbor. Team Steele: Lawrence Schechter, Janin Carlson, Mark Connor, Lisa Lambert (interiors) and Scott Steele. Tenants: Central Oregon Eyecare, Restore Vision Center, Windermere Commercial and Residential Real Estate and Windermere Property Management. Subcontractors & Suppliers: Action Pride Cabinets, Austin Tile & Marble, Bell Hardware, Cascade Painting & Design, Environmental Insulation, High Desert Glass, I & J Carpets, Interior Technology, McWilliams Tile, Plateau Woodworks, Quality Heating, GTS Interior Supply Company, North Country Building Specialties, Severson Plumbing & Mechanical, John A. Varner Construction, Miller Custom Drywall, Scofield Electric Co. and Hometown Superior Cleaning & Maintenance.